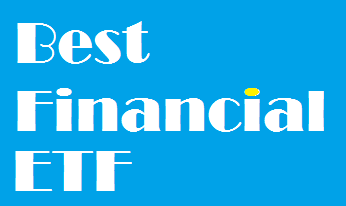 Find best performing financial sector stocks ETFs 2014. 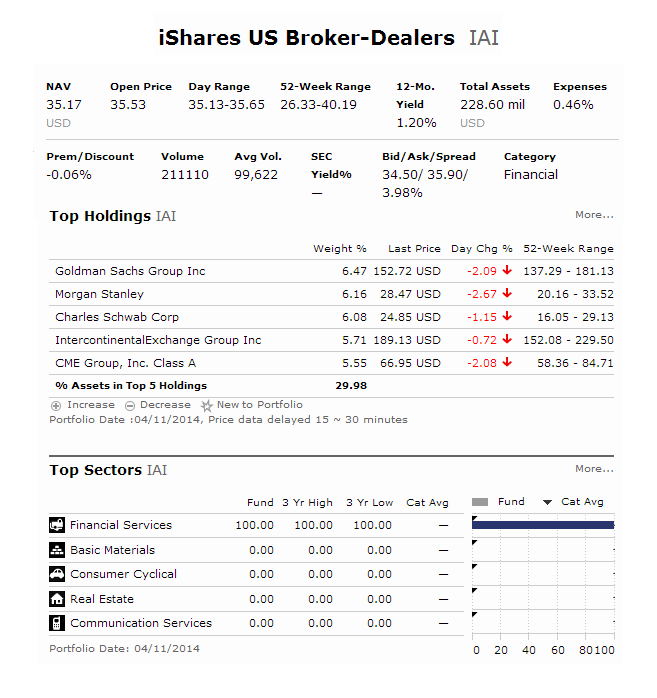 Top exchange traded funds (ETFs) are iShares US Broker-Dealers, First Trust NASDAQ ABA Community Bank, etc. Investing in sector stock exchange traded funds can be rewarding for investors. During certain period of market cycle some sectors may outperformed other sectors. In 2014, value stocks have been thriving. There are several sector funds such as consumer discretionary, industrials, healthcare, financials, energy, consumer staples, technology, utilities, real estate, and materials. As a value sector, financial stock funds may provide higher return for the next years. This financial sector invests in bank, financial company, brokerage firms, insurance, consumer credit providers, etc. Some of the big financial companies include Wells Fargo Co, JPMorgan Chase, Bank of America, Prudential, TD Ameritrade, etc. These top financial funds are selected based on its 1 year performance return. You can find the expense ratio fee, turnover rate, management, fund performance information below. Also, you will see the fund review and fund performance or return below. iShares US Broker-Dealers ETF is an index exchange traded fund that is investing in investment services sector of US equities. This ETF invests in U.S. investment banks, discount brokerages, and stock exchanges. The expense ratio fee is only 0.45%. The current market price is $35.15. The fund CUSIP is 464288794. It has total net assets of 228.60 million. Morningstar has ranked this top performing financial sector ETF 2014 with 1 star rating. For the past 1 year, it has a total return 27.40%. It has returned 7.35% over the past 3 year, and 11.09% over the past 5 year. The top 5 stocks in its portfolio are Goldman Sachs Group Inc (GS), Morgan Staney (MS), Charles Schwab Corp (SCHW), Intercontinental Exchange Group Inc (ICE), and CME Group Inc (CME). First Trust NASDAQ ABA Community Bank Index Fund has an expense ratio fee of 0.60%. It has a low total asset of $92 million. This ETF invest in common stock of all NASDAQ listed banks and thrifts or their holding companies that are designated as banks by the Industry Classification Benchmark. The current share price is $34.90. This best financial sector ETF is ranked with 4 stars rating by Morningstar. In 2013, it has a year-to-date return of 43.49%. 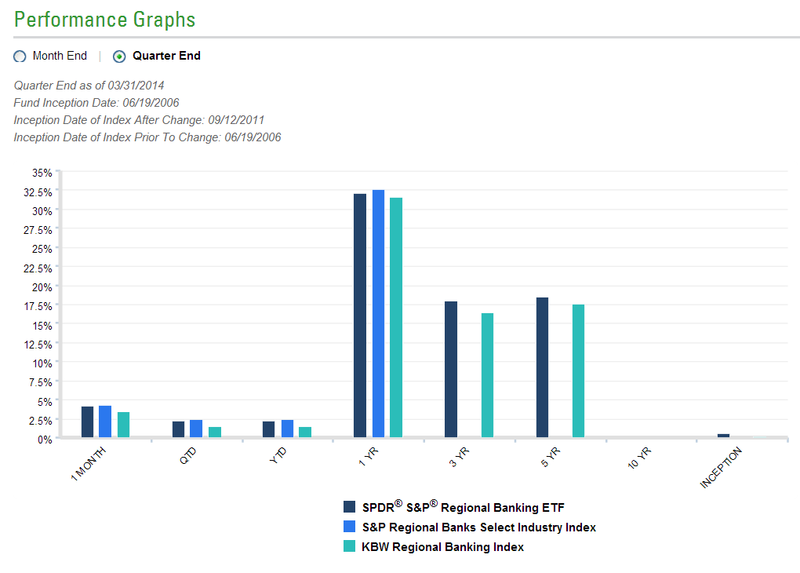 The top 4 financial stocks in its holdings are Signature Bank, Zions Bancorporation, SVB Financial Group Inc, and East West Bancorp Inc.
SPDR S&P Regional Banking ETF is tracking its index benchmark, the S&P Regional Banks Select Industry Index. It has a gross expense ratio of 0.35%. The fund distributor is State Street Global Markets, LLC. The dividend yield is 1.46%. The total assets are $2.5 billion.